Social Entrepreneurs Ireland launched their 2011 Social Impact Programme this week with a call for applications from individuals who are developing new, big ideas to address the social and environmental challenges we face in Ireland. €500,000 in funding and support will be presented to three winners next October to help them grow and increase the impact that they are having in Ireland. Social Entrepreneurs Ireland also announced that the Social Impact Programme would be supported and sponsored by DCC plc. A new three year partnership has been agreed that will see DCC provide vital financial support as well as in-kind support. The call for applications announced this week is the start of an extensive eight month consultation and engagement process which will culminate in the announcement of the winners in the autumn. The closing date for applications is Wednesday February 16. The selection process will include a boot camp in March where applicants will be invited to pitch their projects, leading to interviews from which six finalists will be chosen. The finalists will embark on a three month finalists programme where they will receive some funding and support prior to final selection of the 2011 Social Impact Programme winners in October. The 2010 winners were singer Frances Black who set up The RISE Foundation in 2006 to assist families of addicts to understand the nature of the disease of addiction and the profound effects it has on relationships; Dara Hogan who set up Fledglings Early Years Education & Care having identified a significant shortage of early years education places in disadvantaged areas such as Tallaght West and John Lawlor who created and developed the Bridge to College and Bridge 21 programmes to provide a new approach to learning in schools and to fully prepare students for the demands of the modern economy. In addition to receiving essential financial support award winners receive targeted business and personal support across key areas such as strategic planning, operations, and financial sustainability to help them to successfully develop and grow their ideas to deliver even greater impact in the community. Since 2005 Social Entrepreneurs Ireland has provided support to 142 social entrepreneurs, directly investing over €3.7m into supporting these exceptional individuals. These in turn have directly supported over 170,000 people and indirectly helped another 300,000 people. Launching the 2011 Social Impact Programme and the call for applications Sean Coughlan, Social Entrepreneurs Ireland chief executive said “We are looking for people who are passionate about social change, about making a difference. We are also looking for people who have the capacity to deliver on that passion. In launching our Social Impact Programme we are looking for three exemplary social entrepreneurs who are innovative in their thinking but entrepreneurial and business like about how they plan to deliver that social change. 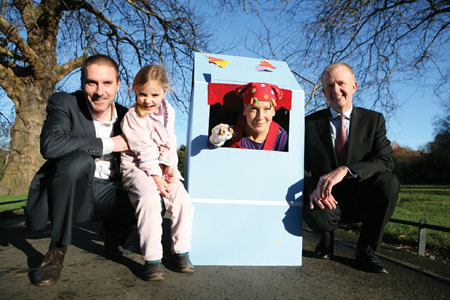 Applications for the 2011 Social Impact Programme must be made online at www.socialentrepreneurs.ie, where full details on the application process, eligibility criteria and the Social Impact Programme are available.